Join us LIVE for the MSc Interaction Design student’s OPEN PRESENTATIONS on Monday 18/12 and Tuesday 19/12 (full schedule below). During these two days the students will be joining in from around the world to present their work live for feedback and peer review. The MSc in Interaction Design (www.idmaster.eu) is offered by the Cyprus University of Technology (Cyprus) and Tallinn University (Estonia) bringing together an impressive experience and knowledge in Interaction Design, Human Computer Interaction Design and Online Learning. The course is offered fully online in English and its current cohort is multi-disciplinary and international coming from more than 25 different countries. 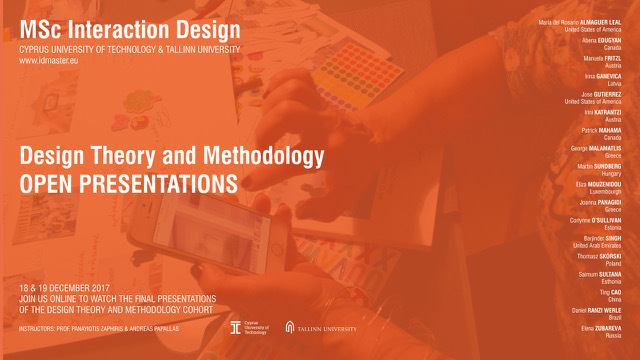 The ‘Design Theory and Methodology’ module aims to help students gain a deeper understanding of design as a problem-solving activity in different contexts. This year the students focused on designing a creative design toolkit and implementing it in generative sessions with stakeholders aiming to foster the inclusion of older people into the digital society.